Not every famous style thrives forever. Mi Zong for instance has been very popular for a long period of Chinese history even extending beyond China’s borders. Yet now Mi Zong is has become less common and “pure” Mi Zong rarer still. Part of the reason may be it’s name which means Lost Track. And that’s not just a poetic description because Mi Zong is well known for its’ basic strategic goal: to completely confuse an opponent. Mi Zong starts with a wonderful Kung Fu legend. Centuries ago, it is said, a servant learned that his employer conducted Kung Fu classes in their own home but only allowed family members to practice in secret at night. The servant found a way to steal into the second floor, make a hole in the floor and looked down on the classes. Every night he would practice what he’d learned. But since the hole size restricted his vision he could only see parts of forms. So, resourcefully, he strung the bits and pieces together into a new form. One day, when the men were at harvest, a Kung Fu challenges showed up to confront the family. When some of the younger male family members were bested the servant stood up for the family and deafeated the challenger with moves so confusing they made him dizzy before the definitive strike. When the men returned they were told the servants actions and decided not only to teach him but to add his “Lost Track” skills to their own. Mi Zong was born. The creator of MiZong was a monk named Jin Na-Luo from Song Mountain, Shaolin Temple.The earliest version was named Mi Zu Chuan (Lost Ancestor Boxing) or Yan Qing Chuan because the monk’s religious named was Yan Qing. During the Sui/Tang Dynasty transition period two warriors, Yan Qing and Cheng Zhi-Jing of Xi-Kang, accidentally killed someone and were forced to flee. Both entered the Shaolin Temple and became monks. Yan Qing called the boxing form after himself while Cheng called it Lost Track. Old monk, Mo Jung, travels to the hills and comes across some monkeys playing together. Fascinated by their agillity and cleverness he creates a special boxing form and anmed it Mi Zu “Secret Ancestor” in a moment of Darwinian insight. Lu Jun-Yi of Da-Ming, HeBei Province, was a student of this Shaolin monk at the Monastery (probably a lay-student). He became quite good, won competitions and was swamped by people wanting to be his disciplie. Being rich, however, he refused students. However, one day he stumbled on his servant, Yan Qing, practicing and, impressed by the display of talent, took him on as a disciple. Yan Qing became a bandit and with because he made enough changes to justify it or because he didn’t want to disgrace his teacher by association, renamed the style Yan Qing Chuan. Later he was said to have joined the rebels-heroes of the Liang Shan Rebellion (Water Margin). His style was therefore banned by authorities. Once, when evading these same troops, he escaped by disguising his footprints so thoroughly they couldn’t follow. This inspired him to again re-name the style Lost Track. Another version has Yan Qing’s student, Man Leung – also a rebel – evading the authorities not once but many times and thereafter calling his version “Lost Track”. One Sun Tong, a native of Tai-An in ShanDong Province was born in 1722. He loved martial arts a lot and studied for ten years under a man namced Zhang who might have been one of Man Leung’s students. 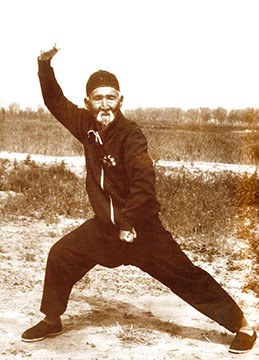 After learning much from Zhang he was encouraged by his teacher to travel around, see Kung Fu and learn what he could. People who worked with him were so impressed they nick named him Sun Tong the “Versatile Iron Leg.” One day he was visiting his teacher’s house but Zhang was gone. Sun conversed with his daughter, Yu-Lan and bragged a bit about what he had learned on his travels. Yu-Lan was unimpressed and challenged him to a competition. Sun decided it was time to leave but Yu-Lan followed him and forced the issue. Sun killed his teacher’s daughter and was filled with shame. He ran away never to see his teacher again. During the QianLung Emperor’s reign he went to Cang County (home or many great martial artistis) to live and eventually taught martial arts in Yao-Guan viallge. Sun Tong was a popular teacher and taught about 100 students. His five major disciples were Chen Wan-Shan (from Chen Xiang), Su Jia-Yuan and Lu Gang-Chui (both from Cang Xian), a master known as Yu (from Ke-Niu), Monk Zhi Yuan (from LiLong village) and Huo Xu-Wu (originally from AnLe village, Dong-Guang then Xiao-Nan-He village, Qing-Hai)- this last being the famous Huo Yuan-Jia’s great-grandfather ( see below). 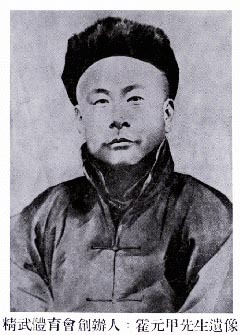 Liu Zhen-Shan was director of the WuShu Society of Wan-Xian County and a “teacher of ten thousand”. Talk about legends, one Mi Zong instrutor has inspired many AND been the subject of at least two major movies. Huo Yuan-Jia was honored as the top instructor of the pretigious “multiple style” school of Shang Hai the Chin Wu Association. A Kung Fu artist of the old school he defending his reputation against all challengers and, it was said, was never defeated. His enemies, among them disgruntled military men of the contending Japanese army, finally poisoned him to get him out of the way. At lest that is what many people think. The revenge rationed out by one of his top students has been the subject of The Chinese Connection with Bruce Lee (the real one) and Fist of Legend with Jet Li. Both stories are based on known stories and facts about the incidents though have different endings. Whatever the reasons for its fame, Mi Zong is a fascinating style. While some forms of martial arts are well known for their straight line approach (such as Shaolin and Wing Chun) Mi Zong is the opposite. MiZong perfectly lives up to the old Kung Fu adage, “One hand empty, the other full.” MiZong messes with the opponent’s consciousness by mixed the straight and the curved, the substantial and the insubstantial. 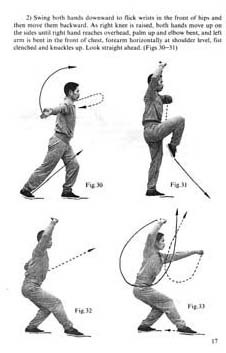 The movements of Mi Zong are similar in presentation to those of such Long Fist styles as Shaolin, but the “flavor” of the style is different. Good Mi Zong performers look like they known what they’re doing but don’t do the expected things. Everything is slightly off. Kicks turn to funny angles and stances are mixed in such a way that the typical “roads” of the form are hard to distinguish. Posted January 17, 2009 by Plum Staff. Comments and trackbacks are open. Follow the comments feed. Tagged with: Chin Wu, Hua Yuan Jia, Li Shu Wen, Liu Yun Chiao, Lost Track, MiZong, Sun Tong, Yan Qing.